Sometimes, a tie can be a good thing. For the Tigard High School boys soccer team, a tie was reason to celebrate. The Tigers, after falling behind by a goal in the opening minutes, rallied to tie Lakeridge 1-1 in both teams' Three Rivers League finale. In the process, Tigard also claimed the Three Rivers League championship. On their side of the ledger, the Pacers proved their mettle against the TRL's best team at the end of a long and trying season. "We put it all out there. It was our last game. Everyone knew it, and we just said 'we're going to leave everything out there," Lakeridge senior Adam Kindorf said. "Whenever you're one of the bottom team, you're going to try as hard as you can to beat those really good teams. And you know they probably are more skilled than you, but it doesn't matter — you're going to give it your all." With the tie, Lakeridge finished its season with a 1-4-1 record in TRL play (2-10-2 overall), putting the Pacers in a tie with Canby and Lake Oswego for fifth place in the final league standings. Finishing with a final ranking of 41, the Pacers missed earning a berth in the Class 6A state playoffs. Tigard finished the regular season with a 4-1-1 mark (11-1-2 overall) to tie with West Linn for first place. Tigard beat West Linn 2-1 back on Oct. 16. "Four games ago, I think I said we're on the road to the league championship, and we got it now," Tigard junior midfielder Rasheed Tarhuni said after the match. "This was hard-fought. It wasn't easy at all. Lakeridge came out on their Senior Night and gave it everything they had." "In my freshman year, we didn't do very well," Tigard junior goalkeeper Jackson Cleaver said "Last year, we battled. This year, we just came out with the title. It's great for Tigard, it's great for the community." Next up, fifth-ranked Tigard will host No. 28 Cleveland (6-7-1 overall) in the first round of the Class 6A state playoffs at 3 p.m. Saturday. "It's been what we've been working for since league started, and we wouldn't have got it without hard work," said Tigard senior forward Oscar Jacinto, who scored the Tiger goal. "We're definitely looking to go far, especially with having the home field advantage," Sajjad Al-Rikabi said. "We just need to concentrate and focus and play every game like it's the last game." For Lakeridge, Tuesday's contest was its last game of the season, and, from the beginning, it looked like the Pacers wanted to make the most of it. 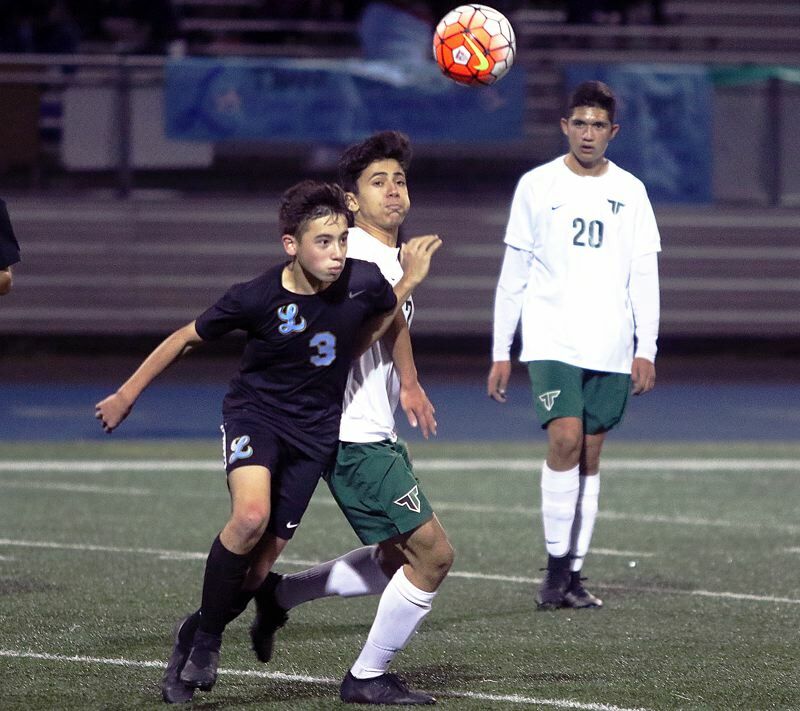 Lakeridge, with senior Seba Marin-Quiros scoring on a shot from the right side, took a 1-0 lead just 3 minutes and 33 seconds into the contest. The Pacers' defense, including freshman Reagen McDowell, senior Nate Goldstein, sophomore Ethan Wagner and senior Adam Sommer, seemed to frustrate the Tigers throughout most of the first half. The Tigers did have a prime scoring chance when sophomore Nick Leinberger hit a shot off a corner kick by Tarhuni, but McDowell was able knock the ball away before it sailed into the Pacer goal with 3:32 remaining in the first half. That helped Lakeridge take its 1-0 lead to the intermission. Tigard seemed to turn up its intensity in the second half. The Tigers had a free kick shot by Marco Gallard sail over the crossbar of the Pacer goal with 33:32 left in the match. Then, with 25:05 remaining, a flick shot by Tiger junior Jacob Thodoroff, coming off a pass from Jacinto, was saved by Lakeridge senior goalkeeper Xander Abbott, preserving the Pacers' 1-0 lead at that point. But with 16:58 left to play, Tigard finally got the equalizer. The Tiger goal came on a free-kick attempt by Jacinto, with the line-drive shot finding its way inside the right post of the Lakeridge goal, tying the match at 1-1. "It was actually a lucky goal for me," Jacinto said. "I was aiming for one of the forwards to make it in, but he missed it and it went in by luck." Lakeridge tried to battle back after the goal. Kindorf had a shot from 35 yards away drift wide left of the Tigard goal with 13:12 left in the match. Then, with 10:48 remaining, Kindorf broke past the Tigard defense and had an open shot from 15 yards out on the right side. But Cleaver, diving to his right, was able to make a save on the attempt. "Adam had an open shot and I tried to cut off the angle," Cleaver said. "I looked in his eyes and then I looked down and I saw he was going right and he just mis-hit it. Any other day, he'd probably put that in on me. It was just lucky for me." Tigard then went on the attack. Jacinto had a shot from 40 yards out blocked by a leaping Abbott with 10:05 remaining. Just 30 seconds later, Tarhuni's shot from 30 yards away clanged hard off the right post of the Lakeridge goal. "This game is a matter of inches. Anything can happen," Tarhuni said. The Tigers then got three shots by Jacinto and one by junior Ivan Orozco in the final minutes, but none of them found the net, leaving the teams in a 1-1 tie — and Tigard with a league title. "We had some good chances in the second half, but Lakeridge kept fighting back," Tarhuni said. "But we finally found the net, with Oscar's free kick, and we celebrated." "Even with a tie, it was good," Kindorf said. "It would have been frustrating to get a loss on your Senior Night. I'm fine with a tie, especially with getting just two wins on the season. Coming out with a tie was nice." Tigard had 10 shots on goal, including eight in the second half, and two corner kicks.